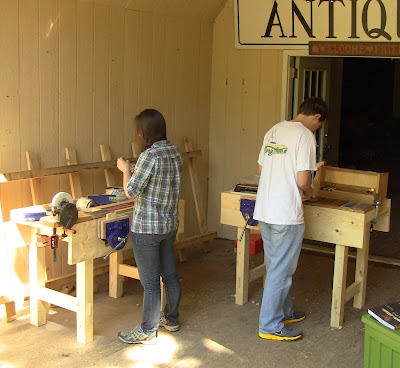 The workbenches set up in the shade at the entrance to the barn at Brookdale Farm. Why work inside on a day like this? The inaugural class at the Close Grain School of Woodworking this past Saturday was a spectacularly gorgeous spring morning. I had two students, Reeve Goodenough and my daughter, Shelby. Thanks for being the first to sign up, Reeve! Part of the reason for being so early was to get things setup on site. I had to unload two of my newly-built Paul Sellers workbenches and re-attach their vises. Some last-minute tuning up: the inner jaw was rubbing against the guide rods when moving the vise. I removed the jaw and planed the bottom to provide clearance. Suddenly we saw a large shadow sweep across the ground and heard the rippling of a canopy. 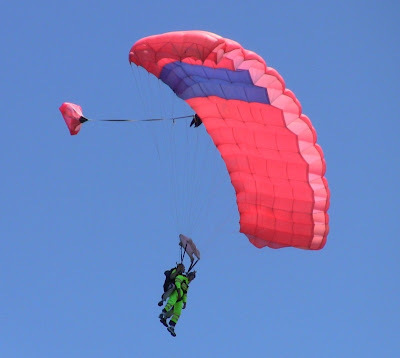 We looked out and saw several skydivers spiraling down. 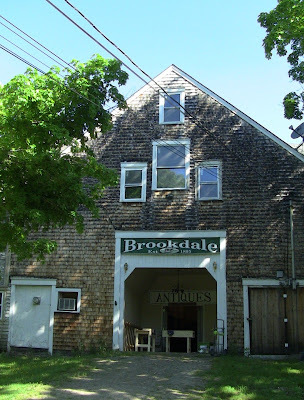 Remember I said this was just across the street from Skydive Pepperell? I'd also like to mention that we share space in the barn with Restore Hockey, a charitable organization that restores used hockey equipment to deliver to programs, families, and individuals who would otherwise not be able to play the game. The topic of the class was sharpening. I gave them a safety briefing (we are dealing with sharp tools here) and pointed out the location of the first aid kit, then described the vociferous differences in opinions about how to sharpen. I presented these as a series of choices about methods, media, and bevels. Jig or no jig? Strop or not? How much to strop? My goal was not to say any one is best, but to give them a chance to feel for themselves what each was like, what feedback they get from the abrasive. Put an edge on, test it out, dull it on the sandpaper, and try another. Try different grinding patterns and bevel shapes. I showed them jigs, but encouraged them to develop free-hand skill. Then they can make a more informed choice moving forward. That choice may change as they get more experience, developing more control and gaining confidence. Much of the technique refined on any one is transferrable to another. Reeve has been using sandpaper on granite plate; Shelby has never done any sharpening before. 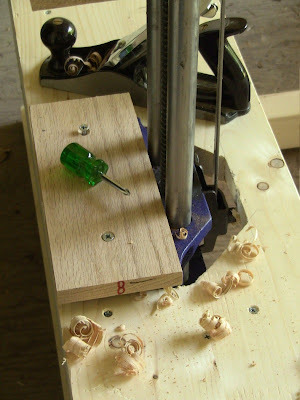 To test their results, I had them take end-grain shavings on pine and oak. 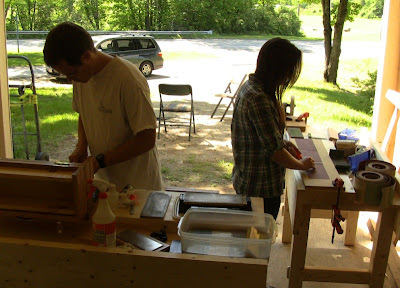 After they had a chance to try the different methods, I showed them how to sharpen and set saws using a saw vise, and how to sharpen and use card scrapers. As usual, the 3-hour class flew by, but we were able to cover a lot of material and try a lot of hands-on work. 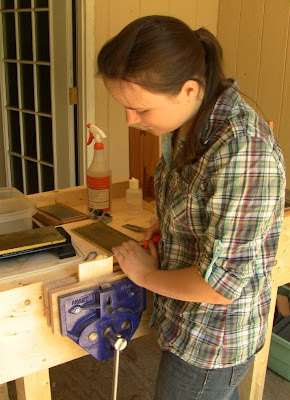 Shelby examining a chisel edge while sandpaper sharpening, as Reeve tries out the oilstones. 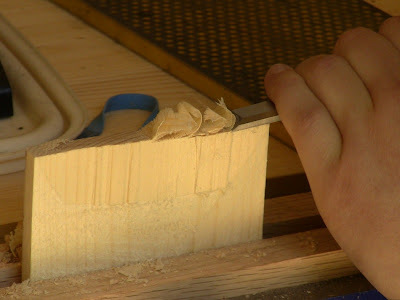 Reeve sharpening one of his mortise chisels. Shelby testing the edge of her chisel after using the DMT Duo-Sharps. She felt most comfortable with these because she was worried about gouging up the surface of the sandpaper and the stones. Closeup of the fine pine end grain shavings she was able to get. Reeve had gotten the same Lie-Nielsen card scraper free with his subscription to Fine Woodworking as I had, but hadn't known what to do with it. Now with a few minutes of instruction and practice he was able to take nice feathery fine shavings. 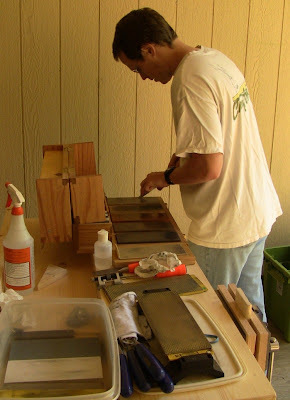 He and Shelby both tried sharpening and setting several inches of rip and crosscut saws, then went back to chisel sharpening. But they were both able to see that saws can be sharpened quickly. 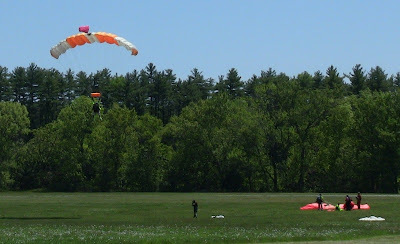 The skydivers continued to drift down all morning, a lot of tandem student jumps and a few solos. 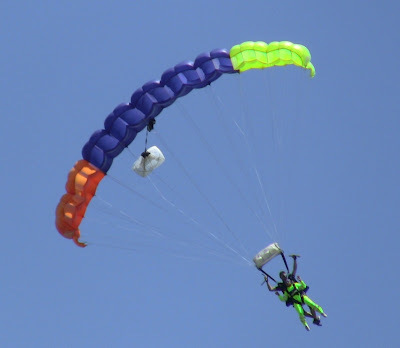 You could hear the difference, because the solo jumpers tended to come in faster, canopy roaring before flaring at the ground. Too fast, in fact, for me to get any good photos of them. 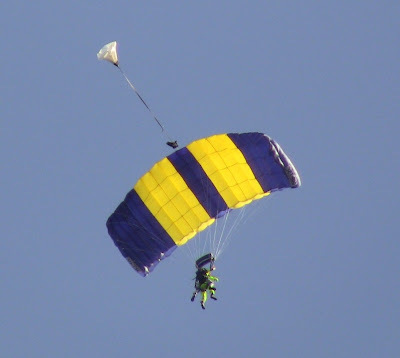 A tandem pair heading for the ground target. A pair swooping around. This looks like fun! If you're interested in taking some group woodworking classes, check the schedule, or you can schedule your own private classes. This looks great Steve! Good for you! How exciting. I wish you the best success and applaud you for sharing your skills. Thanks for the great instruction, Steve! It was just the kind of class I've been hunting for. Looking forward to the next session! I hope we get that ideal weather again! Wow. Congrats, Steve! This is a day for the history books! Congrats! The first day is on the books! Hope you have many more.